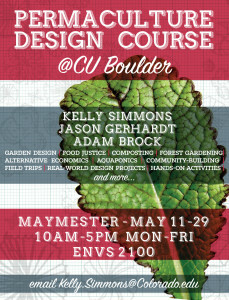 I wanted to let you all know about the CU Permaculture Design Course coming up. 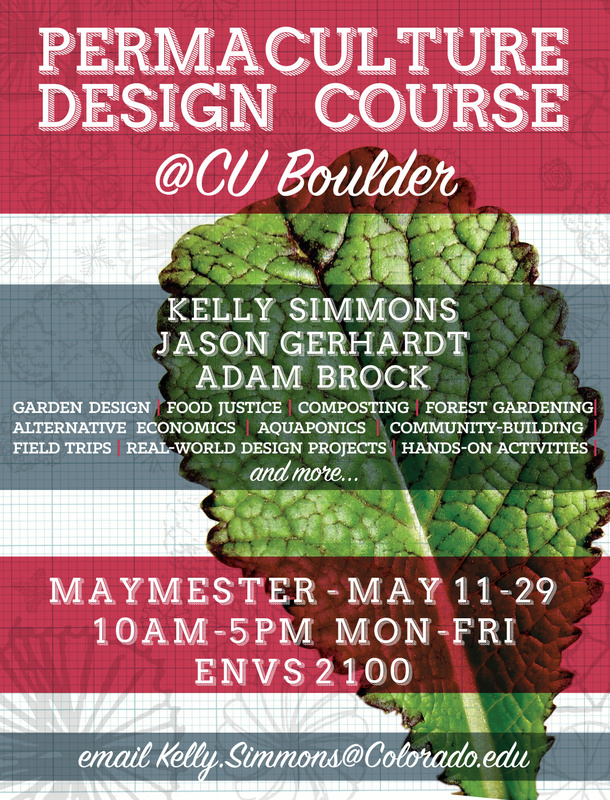 This is also offered to the public so if you know anyone looking to delve deep into permaculture on the Front Range it will be a fantastic option. The flyer is attached below with details. Do you work with children or teenagers and want to help them practice ecological literacy and systems thinking? Are you a teacher interested in strategies to augment sustainability education while actually reducing your total workload? This course will teach participants to apply systems design thinking in a classroom setting through lectures, discussions, tours, and hands-on projects. Focused on creating more connected and practical lessons that increase student ownership and commitment, participants will create action plans and support networks for returning to their schools or workplaces. Michael will detail his own experiences as a public middle school teacher working to augment his existing curriculum with outdoor education and land stewardship while encouraging student-led learning and enterprise. Participants who complete the course are eligible to receive 5 500-level credits from Antioch University for an additional payment of $200. GreenSTEM consists of full days with diverse and engaging activities. Lunch and dinner will be provided, with evening engagements most nights through the week. Prepare to leave these five days changed, invigorated, and full of practical strategies to revolutionize your teaching experience and that of your students. Pairs or teams of teachers from the same school are encouraged to take the course together to maximize effectiveness upon returning in the fall. No PDC required. Scholarships are available, with applications upon request.